If you were teaching a course on how to manage personal finances, one of the best pieces of advice you could give is to avoid attending a for-profit college. A series of government and media investigations have exposed that signing up with a for-profit college could well be one of the worst financial decisions a person could make in his or her entire life. Many of these schools offer a toxic mix of ultra-expensive tuition, low-quality classes, high dropout rates, and poor job placement. As a result, they often leave students -- single parents, veterans, immigrants, and others struggling to earn a living -- without jobs and deep in debt from the loans they've taken out. For-profit colleges have 13 percent of U.S. college students, but an astonishing 47 percent of student loan defaults. So why is Suze Orman -- who calls herself "undeniably America's most recognized expert on personal finance" -- teaching an online personal finance course at the University of Phoenix, the biggest of these controversial for-profit colleges? Last week, celebrity guru Orman spoke at a Capitol Hill event and warned students about taking on too much loan debt. But at the same time she announced that she is launching the online University of Phoenix course. As Orman recently explained, "You interact with this course... You're going to leave with a will, a revocable living trust and making sure you have the right kind of insurance. When you're done with it, oh, you will have your act together." But if you're taking the course, um, you're at the University of Phoenix, and as a result you may end up in real financial trouble anyway. Granted, there are worse institutions than the University of Phoenix, and many of its graduates have indeed gone on the productive careers. But for many students, the school has turned out to be a financial disaster. And Orman's decision to join the University of Phoenix faculty and thus give her seal of approval to the institution does a disservice to Americans across the country who count on her for unvarnished and useful financial advice. Apollo Group, the owner of University of Phoenix, gets about 89 percent of its revenues from federal financial aid programs. Much of that is in the form of student loans, and because of Phoenix's high prices, many students must take out additional high-interest rate private loans to cover all the costs. Tuition for an Associate's degree in Business at the University of Phoenix Online is $24,500. The same degree costs $4,087 at Phoenix College in the Maricopa Community College system in Arizona. A Bachelor's in Business at the University of Phoenix costs $74,575, while the University of Arizona charges $44,200 for the same degree. So students who attend the University of Phoenix usually end up borrowing, and owing, a lot of money. They may often enroll precisely because they have bad information. The University of Phoenix, like many for-profit colleges, has used high-pressure, deceptive boiler room tactics to recruit students. A comprehensive investigation by the Senate Health Education Labor and Pensions (HELP) Committee unearthed University of Phoenix recruiting manuals instructing staff to create a false sense of urgency about signing up. One advised, "Do not tell the student we have classes running every week unless you can agree on a start date, or rolling start dates is a selling point." Another said to tell prospective students, "it looks like I might be able to squeeze you into" the next start date. Likely because of deceptive recruiting, high costs, and weak programs, a large percentage of University of Phoenix students never graduate. The Senate investigation found that of the 280,000 students who had enrolled at the University of Phoenix and the other Apollo school, Western International University, in 2008-09, 60.5 percent had dropped out by mid-2010 -- higher than the 54 percent overall dropout rate of for-profit colleges. Schools like University of Phoenix with high dropout rates also have high loan default rates, and Phoenix's has been rising steadily as the company's enrollment and revenues have increased. By 2008, more than one in five University of Phoenix students was defaulting within three years of leaving the school -- nearly twice the default rate of students at public and non-profit colleges. The company told investors last year that it expected the 2009 default rate to be 26.7 percent. Federal regulations are designed to cut off financial aid to schools with default rates above 30 percent, and it appears that Apollo and other for-profit education companies have addressed this risk by pressuring broke students to put their loans in "forbearance" status, rather than defaulting; forbearance is a paper solution that does nothing to help the student, but allows the school to keep the federal aid pouring in. What do the students get for their high tuition payments and big loan debts? The Senate investigation found that Apollo spent $892 per student on instruction in 2009 -- "one of the lowest amounts spent on instruction per student of any company analyzed." By comparison, the University of Arizona spent $11,128 per student on instruction. Meanwhile, Apollo in 2009 devoted $2,225 per student -- 23.7 percent, or $935 million -- to marketing and recruiting. Last year when Senators Tom Harkin (D-IA) and Kay Hagan (D-NC) introduced a bill to bar for-profit colleges from spending taxpayer money on marketing, Apollo attacked them for offering "misleading rhetoric." The senators had singled out Apollo for employing more than 8,000 recruiters in 2010. Advertising Age recognized Apollo as one of the top 100 spenders on U.S. advertising in 2009 -- $377 million, more than Apple. But instead of thanking Senators Harkin and Hagan for authorizing -- and taxpayers for providing -- most of the money to pay for these ads, and for sponsorships of everything from New Yorker magazine education panels to Good magazine's education website to Arizona's University of Phoenix Stadium, Apollo lashed out. Apollo also devoted $2,535 per student in 2009 -- 27 percent of its revenue, or $1.1 billion -- to profit. And that was in addition to the enormous salaries Apollo paid to its top executives. In 2009, Apollo founder and Chairman John Sperling got paid $8.6 million, more than 13 times the salary of the president of the University of Arizona. Co-CEOs Charles Edelstein and Gregory Capelli shared another $3.4 million. University of Phoenix also has repeatedly been charged with fraud and other misconduct. In 2003, two former employees sued Apollo under the federal False Claims Act, alleging that the company had defrauded the U.S. Department of Education by obtaining federal student aid based on false statements of compliance with federal rules that prohibit schools from paying recruiters based on the number of students they recruit. Apollo settled that case in 2009 by paying out $78.5 million. In 2004, the Department of Education brought a separate suit for these violations, resulting in Apollo paying another $9.8 million. Thirty-two state attorneys general are working together to investigate for-profit colleges, and some of them are pursuing allegations against the University of Phoenix. Florida's Attorney General has subpoenaed the school as to "misrepresentations regarding financial aid" and "unfair or deceptive practices regarding recruiting, enrollment, placement, etc." Delaware's attorney general has subpoenaed Phoenix regarding its business practices. The Massachusetts AG is pursuing whether the schools engaged in deceptive actions with respect to recruit and financial aid. In 2010, Apollo disclosed that the Securities and Exchange Commission (SEC) had requested information from the company about its insider trading policies relating to stock sales made by John Sperling and his son Peter in 2009. In April 2012, the SEC announced it was investigating the company for insider trading following a February 2012 announcement of lower than expected earnings. Instead of atoning for its poor record, the company has been defiant. Apollo founder John Sperling, now 92 years old, is a major donor to Democratic and progressive causes, and he has used that status to personally pressure prominent people in Congress and elsewhere in Washington to undermine Obama administration actions that would hold for-profit colleges accountable. Fortunately, a few universities are realizing their duty to step up to the plate by themselves. The University of Phoenix, for example, makes all its students go through a free and mandatory three-week orientation course to make sure they understand the full costs of college before they sign on the dotted line. These efforts are encouraging. Was Orman already being paid by Apollo at this point, or did she really decide that of all the colleges and universities in America, the one most worthy of being singled out for praise was the University of Phoenix? I don't know. My efforts to contact Suze Orman to hear her side of the story produced no response. But here's a clue. Phoenix's three-week orientation workshop mentioned by Orman is required for prospective students who have fewer than 24 college credits to help them determine if they are "ready for the challenges of earning a degree -- and if our University is right for you." The 2013 syllabus for the workshop shows that new students will view four videos featuring none other than Suze Orman! (Titles: "What is Your Learning Path? "; "Why Do You Want to Go to School? "; "Invest in Yourself"; and "The Value of a Degree.") When Orman singled out the Phoenix orientation course for praise in her USA Today article, she forgot to mention that she was, or would soon be, one of the instructors. Orman certainly seems to be building a strong bond with the school. In January 2012, the University of Phoenix Facebook page posted a link to a new debit card marketed by Orman and asked, "We need your feedback about The Approved Prepaid MasterCard from Suze Orman! Would it be valuable to University of Phoenix students? Let us know what you think." The school may not have gotten the answer it wanted. 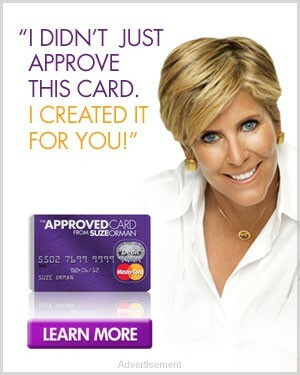 A number of commenters responded that the card would in fact be a bad deal for students, and others have concluded that the Suze Orman Prepaid Mastercard is a bad deal for most people. So why is Suze Orman giving her stamp of approval to the University of Phoenix? Attending that school may not end up being a good deal for you, but presumably the relationship is a good deal for her.